British watchmaker Christopher Ward, founded in 2004, has released a new product C7 Rapide MK II, done in dark green color. The model combines a sporty watch the 50s with a touch of, associated with many of Britain’s brilliant victories in the field of sports. The novelty C7 Rapide MK II design of the original design, due to the color green, which gives the watch an exceptional originality and freshness. Chronograph C7 Rapide MK II is equipped with three counters on the dial, which is inspired by the look of the stock index and the fuel meter turnover, which resembles a racing sports cars. Every detail in the design of new products adds a sense of the rich heritage of the world’s motor racing. Proof of this can also serve as the back of the model – exclusive engraving on the cover of the steering wheel. The novelty round shell with a diameter of 42 mm made of stainless steel. Dark green dial features Arabic numerals, three meters at the labels 12, 6 and 9 o’clock, the three central arrows, covered with fluorescent material, and an aperture date at 3:00. On the outer ring of the model is tacheometric scale. Model C7 MK II is assembled on the basis of Swiss quartz movement Ronda 3540.D with functions: hours, minutes, split-seconds, date, total station. Water Resistant – 100 meters. Delivered new to the straps of different materials or stainless steel bracelet, depending on the desires of the owner. Basically, the model is completed with Spanish leather strap «Toro Bravo» to the unfolding clasp. Buy this watch with a strap can be for 399 £, on a steel bracelet – for 450 £. 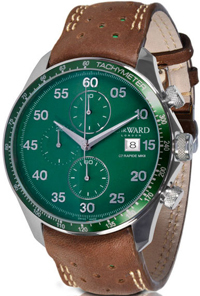 In September, by Christopher Ward will be issued an additional 500 copies of the model, British Racing Green C7 MK II.